Below is a snapshot of the Web page as it appeared on 03/12/2018 (the last time our crawler visited it). This is the version of the page that was used for ranking your search results. The page may have changed since we last cached it. To see what might have changed (without the highlights), go to the current page. You searched for: "Once upon a river" Setterfield We have highlighted matching words that appear in the page below. Replete with folklore, su A dark midwinter’s night in an ancient inn on the Thames. The regulars are entertaining themselves by telling stories when the door bursts open on an injured stranger. In his arms is the drowned corpse of a little child. To ask other readers questions about Once Upon a River, please sign up. Where/how can I get an advance copy of this book?? I don't think I can wait until January! If it's half as good as The Thirteenth Tale, I'll be thrilled! I love the way Diane Setterfield writes...her prose, the research, the detail, etc. all add up to a great read! Although I didn't enjoy Bellman & Black as much as her 1st book, it was still a wonderfully written, enjoyable story...can't wait for Once Upon a River! Would this book be appropriate for a young teen to read? Along the borders of this world lie others. There are places you can cross. This is one such place. This is a beautiful story. It's a genre-crosser: something of a historical mystery told like a fairy tale with magical realism. Everything straddles the line between reality and the supernatural, and sometimes it steps over into the fantastical, which might be surprising for fans of Setterfield's The Thirteenth Tale. I think it works really well, though. I should point out that the story is very slow burn and that's how the whole book unfolds - there's no "aha!" moment when the pace suddenly starts racing. It's a gentle, often sad, story of the magic in the mundane, and the normal in the seemingly miraculous. Setterfield sets the tale along the banks of the River Thames in 1887. True to our own history, this time is rife with superstition and folklore, tales of ghosts and fortune-telling. This allows for some uncertainty over what is supernatural and what exists in the minds of superstitious people. Does Bess really have the ability to look into someone's soul and see their true self, or is she just a woman adept at reading people? I think that's what makes this story so thrilling. The line between our reality and the possibility of the supernatural is a fine one. I love fairy tales that open your eyes to the many "magical" things in our own world. The story follows many characters and is largely centred around an inn called The Swan. One night, an injured man stumbles into the inn carrying a dead child. A child who sometime later is alive. Not only is this a mystery in itself, but so is the child's identity. Where did she come from? Could she be the missing daughter of the Vaughans who disappeared two years earlier? Could she be the grandchild of Mr Armstrong? The child in question does not speak a word. The rhythm of the train on the tracks suggested words to his overtired brain and he heard them as clearly as if an unseen person had pronounced them: Something is going to happen. As with The Thirteenth Tale, Setterfield really emphasizes the power of stories to shape people. The lore believed by these characters plays into their everyday lives, defining them. They are all so well-drawn, living seemingly simple working class lives, but hiding dark secrets and traumas that will, of course, come back to haunt them. Perhaps literally. This is a gorgeous fairy tale, woven with everything that gives fairy tales their timeless quality. It is a quieter, more grounded in reality version of Katherine Arden or Naomi Novik. The feel reminds me somewhat of 2012's The Snow Child, but with a very different setting and a bigger cast of characters. There must be more to stories than you think. *clinks glass* gather round folks, I would like to make a brief speech: Writing historical fiction that replicates authentically the social realities of the past might require depicting racism and discrimination, but it does not require writing a racist story. I enjoyed many aspects of this story--the beautifully expansive prose, the setting, the mystery--but it's hard to hold on to that feeling upon turning the last page when reality reasserts itself. I'm disappointed that this book appropriates *clinks glass* gather round folks, I would like to make a brief speech: Writing historical fiction that replicates authentically the social realities of the past might require depicting racism and discrimination, but it does not require writing a racist story. I enjoyed many aspects of this story--the beautifully expansive prose, the setting, the mystery--but it's hard to hold on to that feeling upon turning the last page when reality reasserts itself. I'm disappointed that this book appropriates a black narrative but fails to examine, address and challenge the racism that its mostly-white cast of characters displays. The main black character in this book is treated disdainfully by every single other character until they take stock of his expensive clothes and how well spoken he is and discover--and I quote--that " his blackness is superficial ". This is messed up on so many levels and I might have held my judgment and given the novel the benefit of the doubt had this not been a recurring theme throughout the story. I might even have been more kindly disposed towards it if that attitude was recognized as inherently racist and harmful. Instead, the novel not only perpetuates color blindness but also implies that the black character was only worthy of respect because he was a 'cultured' one. Once Upon a River by Diane Setterfield is a 2019 Atria/Emily Bestler Books publication. A deeply mysterious, hypnotic and fantastical Gothic yarn! Nearly a century ago, on Winter Solstice, folks assembled together at ‘The Swan at Radcot’, a local inn, where they plan to spend the evening swapping stories. But, suddenly, a stranger comes staggering in, half drowned, carrying a young girl, who appears deceased. However, when the local nurse is called to the scene, she discovers the child is breath Once Upon a River by Diane Setterfield is a 2019 Atria/Emily Bestler Books publication. Nearly a century ago, on Winter Solstice, folks assembled together at ‘The Swan at Radcot’, a local inn, where they plan to spend the evening swapping stories. But, suddenly, a stranger comes staggering in, half drowned, carrying a young girl, who appears deceased. However, when the local nurse is called to the scene, she discovers the child is breathing- appearing to have miraculously returned from the dead!! The man who rescued the child has no idea who she is. While the girl remains mute, she is claimed by three different people or families. One woman dubiously claims the girl is her sister, while another couple, devastated by the kidnapping of their only daughter, is positive the child is theirs, and yet another couple is convinced the girl is their grandchild, the daughter of their ne’er do well son. While the base foundation is built up around the mystery of the Lazarus child, there are several separate threads embedded within the main story. Each character carries a burden, a secret, or extreme guilt, but they also carry hope and the wish to keep the child away from any harm, refusing to become combatant with the others who wish to claim her. The author weaves magical realism into the mysterious tale seamlessly, creating an exquisite Gothic atmosphere so thick you can slice it. This book is perfectly suited to my taste in Gothic fiction. I loved the mystery, the allegory, and the combinations of various historical and Gothic styles the author employs, which pays homage to a few literary greats. In many ways, this novel is an ode to storytelling, because the art of verbal storytelling, is at the core upon which the book is based. The residents who gather at ‘The Swan’ and their stories, are referenced often. Even the title, borrows from the age old ‘Once Upon a Time’ which precedes a great many stories which have been passed down for centuries. These tales, legends and myths, folklore and fairytales, can challenge the imagination, and nurture creativity, as well as pass along a few lessons, encouraging one to exercise a little critical thinking, as well. This absorbing tale slowly lures the reader into its web, moving at a languid pace, bringing various threads together a little at a time, while providing what might be best described as vignettes within the base of the story, which keeps the reader invested, while adding depth, character, and emotions into the mix, leaving one transfixed by the all the implications and developments, the imagery, whimsy and reflection. This story does have a large cast of characters, does meander a bit, and is very dense, which did require a sharper focus on my part. Ironically, though, the large cast, and the intricacy of the plot, which I normally struggle with, was an asset and not a hindrance, in this case. However, one may need to exercise a little patience, in the beginning, and I might also suggest unplugging for a while, to fully absorb the rich textures and layers of the story. Savor this one slowly when you can give it your undivided attention. If you follow my reviews, then you know I love Gothic tales- so of course, I was easily drawn into this unique story, and relished every second of it! For those who aren’t into Gothic stories as much as I am, this one might challenge you a bit. But, if you stick with it, you may discover, that while it might be an acquired a taste, once you’ve been bitten by the bug you'll be a fan for life. "It was solstice night, the longest night of the year... And as the borders between night and day stretch to their thinnest, so too do the borders between worlds... Unexpected things can happen. Did the solstice have anything to do with the strange events at the swan? You will have to judge for yourself." As a newcomer to Diane Setterfield's work and hearing what a legend she is in the book community, I was excited and a little bit anxious to see how I would receive her brand of storytelling. I w "It was solstice night, the longest night of the year... And as the borders between night and day stretch to their thinnest, so too do the borders between worlds... Unexpected things can happen. Did the solstice have anything to do with the strange events at the swan? You will have to judge for yourself." As a newcomer to Diane Setterfield's work and hearing what a legend she is in the book community, I was excited and a little bit anxious to see how I would receive her brand of storytelling. I was blessed beyond all measure to read this alongside dear friend Leigh Kramer, and knew that no matter what the outcome we would have delightful discussions along the way. From the very first page I knew this story would be something special; the lush prose and dreamlike atmosphere were enticing, and Setterfield's gift in speaking directly to the reader drew me in and gripped me like a vice until I turned the final page. "When the cold river doesn't feel cold, that's when you know you're in trouble." I've seen some varied opinions of this book, and what I've noticed so far is how, whether feelings of delight or boredom, readers have strong opinions of this story. As someone who was able to go into this knowing that it would be a slow burn from start to finish, I think it gave me the perspective I needed to pick it up at just the right time so that I could let the story guide me gently along, rather than feeling like I had to cram it in and blow through it in a hurried frenzy. For those looking for a fast paced, plot driven mystery, you won't find it here, but for those searching out a unique story tinged with just the right amount of magic to keep you wondering if this story is indeed supernatural, let me introduce you to Once Upon A River. "All she was left with when she rose stiffly and took her coat off to go to bed was a deep and impenetrable mystery. OUAR is the type of story that I could spend pages writing about the atmosphere and "feels", but I also want to take a moment to discuss the characters. There is quite a large cast in this book, and it does take a good chunk before everyone becomes familiar and things begin to fall into place and connect. I found myself texting Leigh frequently asking "wait, now who is this again? And who do they belong to in the story?" because she is gifted in keeping up with all of the confusing things in life. I highly recommend finding a Leigh, but you can't have mine. It was interesting to see which characters we clicked with instantly, which had to grow on us, which ones we hated throughout, and how some of our views changed as the story progressed. "And now, dear reader, the story is over. It is time for you to cross the bridge once more and return to the world you came from. This river, which is and is not the Thames, must continue flowing without you. You have haunted here long enough, and besides, you surely have rivers of your own to attend to?" This book was so wonderful, and I think the author did a fantastic job of portraying a vivid, diverse cast of a small town community in the late 1800's, and I believe my only minor issue was with the way the story ended for one character, Rita. While I can't go into detail here due to spoilers, I was a little disappointed that her personality and morals took a 180 in the very final passages, as she was my absolute favorite character in the book for those reasons. Overall though, there's not much to complain about here. OUAR was the kind of book that makes you believe in rich, traditional storytelling once again, and includes the type of writing that feels somehow elevated from most current publications. Highly recommended for anyone looking for a novel that will sweep you away into a whirl of magic you had forgotten existed since you were a child. On a deep, dark night at an inn located on the Thames river, the regulars have gathered to swap stories, drink and unwind from their days. The evening is like any other night at the inn, until an injured stranger walked in carrying what they believe to be a doll in his arms and collapses. After calling upon the local midwife/nurse, they learn that the "doll" is a young girl. A young girl who appears to be dead after drowning in the river -yet lives! No one recognizes the man or the child. Word g On a deep, dark night at an inn located on the Thames river, the regulars have gathered to swap stories, drink and unwind from their days. The evening is like any other night at the inn, until an injured stranger walked in carrying what they believe to be a doll in his arms and collapses. After calling upon the local midwife/nurse, they learn that the "doll" is a young girl. A young girl who appears to be dead after drowning in the river -yet lives! No one recognizes the man or the child. Word gets out, as word often does, and the villagers begin whispering their theories. There are also families out there with missing daughters. Those who desperately want their child back, those who want to see this four-year girl to determine if she is their missing loved one. The girl never appears to recognize anyone, nor does she speak. She looks longingly at the river as if waiting for something or someone. Like the Thames river, this book flowed. There are a lot of characters in this book and after a couple of chapters I had them straight. Setterfield has built a community of characters who have their own backstories and history. All the families and back stories are important. So, no skimming! This book felt epic in nature. It's also atmospheric with the river, the rain, the countryside. I could imagine everything that was happening. We are not told the year, but this took place after photography was invented, so I placed this during the mid-1800's. As with all books, there will be characters the reader likes and those we are not meant to like. Armstrong and Rita were my favorites. I loved Rita's inquisitive mind and her dedication to science and conducting experiments to make sense of things medically such as how does cold water affect the heart rate. Living in a time of superstition and belief in magic, she was ahead of her times in my opinion. Armstrong was a gentleman who loved his family and was decent and kind even when there were those who were not kind to him. This book relies on folklore and the mystery of the missing girl. But this is not the only story/mystery in this book. Setterfield has crafted many stories within her story/novel. Each family is distinct and as the plot unravels, the reader learns that there is more than one mystery in this book. Not only do most characters have backstories as I previously mentioned, there is also the story of Quietly- a character I wasn't sure was real or a piece of local folklore used to explain life and death on the Thames. I loved the writing, descriptions, and the way the plot unfolded in the end. With each twist and revelation, came new information, leaving me with several "aha" moments while reading. This book is on the longer side and at times it felt a little long but then, at book's completion, I understood the reason for its length. Initially, while reading, I thought perhaps this book could use a little editing, but again, once I was finished, I appreciated knowing all the information and it all came together in the end! Keep in mind that although this book has mystery and some suspense, it is largely character driven. For me this made for a slower yet very satisfying read. This is not a book one should plow through or try to read in one day, take your time and again, no skimming. Even if you think something is unimportant, most likely that will just be the part, that you need to pay attention the most! Atmospheric, well-written, engaging and interesting. This was like reading a fairy tale for grown-ups. Setterfield has proven yet again that she is a great story-teller! Thank you to Atria Books and NetGalley who provided me with an ARC of this book in exchange for an honest review. All the thoughts and opinions expressed in this review are my own. I was attracted to something that I read about this book which describes an inn where people came to tell their stories. The thought of that reminded me of Canterbury Tales, read many, many years ago in college - about travelers telling their stories. There are many stories here to be told and I was drawn in from the beginning by the descriptive writing of the River Thames, the characters. I was on the river, at the inn and in the lives of this cast of characters. I always hesitate to use the wo I was attracted to something that I read about this book which describes an inn where people came to tell their stories. The thought of that reminded me of Canterbury Tales, read many, many years ago in college - about travelers telling their stories. There are many stories here to be told and I was drawn in from the beginning by the descriptive writing of the River Thames, the characters. I was on the river, at the inn and in the lives of this cast of characters. I always hesitate to use the word atmospheric because it’s used so often, but in this case it’s the best word I can come up with to describe the feel of this novel. Something happens at the inn known for story telling, the Swann at Radcot when an injured man and a little girl appearing to be dead show up. Shortly after, Rita, the nurse who could easily be a doctor, is examining the little girl and then she’s not really dead anymore. This is not just the story of the girl, who mesmerizes anyone who sees her. While she is an attraction to many people, she also represents hope to others who have lost a little girl, wanting her to be theirs. Is she the Vaughn’s missing daughter Amelia or is she the Armstrong’s granddaughter Alice or is she Lily White’s little sister Ann who has been missing or will she belong to Rita, who it seems has brought her back to life ? Does she belong to anyone? There is mystery and magical realism and the fairy tale like quality of the girl was reminiscent for me of The Snow Child. I needed to be patient with this one because I felt it was slow at times and maybe a little long. Having said that, the writing is lovely and there are a number of characters to connect with. I loved the ending. Diane Setterfield has already written one of the most intriguing, haunting novels of our times. The Thirteenth Tale is the beautifully strange love-child of ...Wuthering Heights and Jane Eyre, its Gothic atmosphere and the dialogue faithful to the vision of an extremely gifted writer. Once Upon A River is even better. No, it is infinitely better and you know how much I loved The Thirteenth Tale. In fact, it is already a member of The Best Books of 2019 squad. It is a dark night in the heart of winter. In the Swann, an inn by the Thames, the usual customers have gathered to wash away the day’s toil with a tankard of ale and haunting stories of ghosts and restless deeds. The door open as suddenly as the burst of the wind. A man staggers inside, carrying a girl in his arms. But the little one is dead. Frozen and still. And a few hours later, she is alive again, a female Lazarus that leaves everyone in awe. Who is she? How did she come to be there? Who are her parents? An entire community begins a frantic search for the child’s past. In doing so, other secrets come to surface, buried feelings and aspirations and the ones involved come to realise the past is always one step ahead of all of us. It is extremely difficult to write about this novel. Not because of potential spoilers, a word that has no meaning here, but because of the intricacy and the writing that is eloquent, lovely, haunting like a dark landscape immortalized in a painting. It is a novel that one must read in order to understand the beauty of it. The striking first chapters and the narration that chronicles the premonitions of the characters will become one of the most impressive literary moments you’ll ever experience. Diane Setterfield uses motifs and symbols beloved in British Gothic Literature, like the inn and the river. The inn where secrets are created and disclosed, the river as a source of life and continuation, as a threat and a mysterious destination. We are all aware of myths and beliefs associated with the communities developed close to rivers and here they are put in excellent use. How beautifully the scents and the sounds are depicted in this novel… ‘’The fragrance of nutmeg and allspice mingled with tobacco and burning logs, and the smell of the river receded.’’ The winter darkness and the anticipation of the summer solstice, the change of the seasons, the change of our wishes. But does human nature ever change? This is something that myths like the one of the Changeling and the haunting story of Quietly and his family try to explain. Photography also acquires a special function in the story because if we come to think of it, it is a supernatural form of Art. Having an image of ours that will outlive us and will never fade must have seemed monumental at the time and even now, we desire to immortalize our finest moments, our loved ones, all the beautiful places we visit. I would be negligent if I didn’t mention what I felt to be the most important theme in this beautiful book. Parenthood. The unimaginable pain of losing your child, the false hopes, the fear and suffering that are ever-present during the birth of a child, the need for an offspring that exists in most people. Setterfield creates a marriage between everyday themes, haunting settings and a peculiar, eerie story and the writing reaches perfection. What does it mean ‘’slow book’’ or ‘’fast book’’? Most of the times, characterizations such as these mean nothing. We have ‘’good’’ books and ‘’bad’’ books. Quality book and books- junk that I wouldn’t gift to my enemy. Once Upon A River is one-of-a-kind. The dialogue is outstanding, exceptional. So faithful it is that you will immediately feel transported to the 19th century, mingling with nobility and ordinary people who love to sit in a dimly lit inn. Rita and Henry Daunt are marvelous (...and I might have fallen in love with Mr. Daunt a little too much…) Margot, Mr. Armstrong, so many interesting characters that will keep you a fine company. I could say that this novel could have been the child of Thomas Hardy, George Eliot, Charlotte Bronte and every favourite Victorian writer of ours. But this would be an injustice to Diane Setterfield, an outstanding writer that doesn’t need comparisons. She is already one of Britain’s greats and I am certain that she will remain so for a long time. Once Upon A River and The Thirteenth Tale are classics in the making. This is how Historical Fiction is done to absolute perfection. Many thanks to Penguin Random House UK and NetGalley for the ARC in exchange for an honest review. The Swann is an ancient Inn, along the Thames where lots of storytelling is done there. On a dark night someone was telling a story the door opened and a newcomer came in. They were trying to make sense of what they were seeing. They thought it might of been a monster from a folk tale. Once there senses came togethor, they noticed in his arms was a puppet with a face and limbs and painted hair. The man was unconscious and they put him on a table. They thought he was dead. Margot, the owner of the The Swann is an ancient Inn, along the Thames where lots of storytelling is done there. On a dark night someone was telling a story the door opened and a newcomer came in. They were trying to make sense of what they were seeing. They thought it might of been a monster from a folk tale. Once there senses came togethor, they noticed in his arms was a puppet with a face and limbs and painted hair. The man was unconscious and they put him on a table. They thought he was dead. Margot, the owner of the inn, laid a feather in his lips and it moved. He was breathing. No one knew him. Jonathaon put the puppet on his lap. He noticed that the puppets hair was made with real hair and it's ears looked so real. He gave it a shake and the arm swung from its shoulder. Then he noticed it was a little girl. She wouldn't wake up. They thought she drowned and was dead. Rita thought she was four years old. She had no pulse and wasn't breathing. The girl was dead before she went into the water. There was no sign on how she died. After some time the corpse opened her eyes. The girls head moved. Her eyes closed again and they noticed her chest was moving. She was breathing in and out. What made this girl come alive again? Who does she belong to? Is it a miracle or is it magic? Did it have anything to do with the winter solstice? This book was so beautifully written. You could just get lost in the prose. I just loved the atmosphere. I love this author and loved The Thirteenth Tale by her, so I just had to read this one. I loved it just as much. I thought this was a character driven novel and thought the characters were well done. I just loved Rita. The book needs to be read slow, there was a little confusion for me, but then all the peices came together and it then becomes a mystery. It is a thought provoking novel. It really makes you think. I thought it was very enchanting and it was very well crafted. The book is part historical fiction, a little fantasy, magical realism, and mystery. Just a little something for everyone. Even though it has a slow burn to it, I suggest to keep reading it because it gets a lot better. I am so happy that I stuck with it. I highly recommend it, if you don't mind a slow burn. Once Upon a River takes place in a historic ancient inn on the River Thames in England. This inn is famous for its storytelling and its storytellers, and in fact, when a mysterious stranger with obvious physical injuries incoherently bursts into the inn with a commotion, stories are in the midst of being told. The stranger eventually passes out, but not before the body of a dead young girl is removed from his arms. But she’s not dead. She comes back to life. Was she ever dead? Questioning miracles, science in the age of Darwin, and magical powers; which one caused the girl to be alive again? I felt like Diane Setterfield was sitting by the fire in an ancient English inn telling me a story. I’ve never heard her voice, but I’ve imagined it. She followed me on Twitter, which has me majorly star struck, I must say, especially when she tells stories this way. Ahhh! Sitting by that roaring fire, I snuggled right up into this book. There was something warm about it, a touch dark, romantic, tense, mystical, and every one of those things added up to a book I quite simply adored. Thanks to Atria Books for the complimentary copy. All opinions are my own. A Tale of Folklore, Legend, Magic and Mystery. Late one night at a pub called the Swan at Radcot on the River Thames, villagers unwind with a pint, as they often do. A man comes to the door with the body of a cold, lifeless girl in his arms and promptly passes out. He sleeps for days. Rita Sunday, the town medic, checks them both over. To her astonishment, she soon discovers that the young girl is, in fact, alive. People come from near and far to see her, including three f 4 Fantastical Stars! People come from near and far to see her, including three families, all of whom claim her as their own. The Vaughns, whose daughter Amelia, went missing two years ago; Lily White, age 40, who believes this girl is her sister Ann; and finally Robert Armstrong, who is positive that she is his son Robin’s missing daughter, Alice Armstrong. This girl is mute and is completely unanimated, except when watching the river, watching and waiting, for what, we do not know. It is said that the river is known for taking care of its own. For bringing back lost things and saving people from harm. That a man named Quietly guards it, only bringing back those to safety who actually deserve it. Who is this little girl and to whom does she belong? That is the question. You’ll have to take a trip to the Thames, to find out. This is a novel which includes vivid descriptions, all of which enraptured me with their elegance and their fierceness and simply captured my heart. Once Upon a River has multiple storylines, all of which are interwoven together brilliantly as each and every storyline in this novel falls together in a way I never would have imagined. What more can I say except that this is a novel to read slowly and cherish. It is a great read for lovers of epic novels, readers who like magical realism and those who like rich character driven novels. 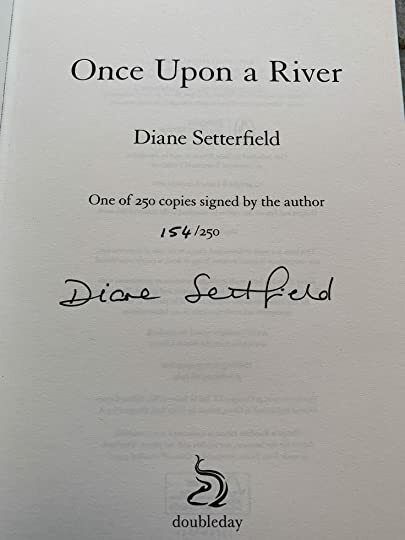 Once Upon a River is the first book I’ve read by Diane Setterfield and it won’t be my last. This was a another buddy read with Kaceey! Thank you to Meriah Murphy at Atria, NetGalley and to Diane Setterfield for an ARC of this novel in exchange for an honest review. Published on NetGalley, Goodreads, Twitter and Instagram on 12.2.18. Once Upon a River by Diane Setterfield is an ode to rivers and a celebration of the imagination and art of storytelling set in the Victorian era around the local communities living in Oxford next to the Thames. Once upon a time in an ancient inn, The Swan, where storytellers are revered beyond measure, an injured stranger bursts through its doors, falling down unconscious clutching the corpse of a drowned young girl. The dead girl comes to life, afflicted by a muteness, sparking a desire in othe Once Upon a River by Diane Setterfield is an ode to rivers and a celebration of the imagination and art of storytelling set in the Victorian era around the local communities living in Oxford next to the Thames. Once upon a time in an ancient inn, The Swan, where storytellers are revered beyond measure, an injured stranger bursts through its doors, falling down unconscious clutching the corpse of a drowned young girl. The dead girl comes to life, afflicted by a muteness, sparking a desire in others to take her in. Stories of this miracle burgeon, spreading like wildfire, taking on a life of their own, emulating the nature of Chinese Whispers as the lines between reality and fiction blur. Amidst the swirling geography, poetry and spirit of the river, the flow of the Thames encompasses the past, present, and the future. 4+ A wonderful homage to the art of storytelling. I come from a long line of storytellers, summers when my cousins were led on ghost walks by our fathers and uncles as they told ghoststories. We all loved those times. Stories I made up to tell my children when they were young, and then stories I told my grandchildren. Such fun, pre internet days when stories were magic, or scary, but such a great way to connect. All along the Thames are a group of inns, each in has a specialty, music in one, art 4+ A wonderful homage to the art of storytelling. I come from a long line of storytellers, summers when my cousins were led on ghost walks by our fathers and uncles as they told ghoststories. We all loved those times. Stories I made up to tell my children when they were young, and then stories I told my grandchildren. Such fun, pre internet days when stories were magic, or scary, but such a great way to connect. All along the Thames are a group of inns, each in has a specialty, music in one, art in another, but it is the Swan In where villagers go to hear and tell stories, and it is here that this particular story begins. A man, half drowned, bsd badly injured, stumbles into the inn carrying domething in his arms. It is what looks like a young dead girl, but here the story starts it's twist. The girl, determined to be able four, returns to life. Three different people claim her as theirs, but who is she really? Folklore has it that a man, travels the Thanks, ferrying to the other side those that have drowned, but returning to land those whose time has not come. So we mix folklore, with storytelling, and a mystery with some magical happenings. We meet some people who have had tragedy in their lives, all with their own stories and how this young girl fits into them. A delicious Gothic tone, and some key elements. A river, water, the giver and taker life, in fact most chapters begin with a look at the river. A slowly paced book, a book to settle in with and not rush through. Setterfield has again written a book that intrigues, pulls the reader in, slowly giving us a tidbits here and there as we try to piece it all together. And always in the background the importance of stories and storytelling in our lives. This is the most long winded book I think I've ever read. It's been a long time since a book has given me feelings of dread every time I picked it up. Although I've never read a book by this author, I was nonetheless excited to dive into this one based on the rave reviews for not only this book but for Setterfield's The Thirteenth Tale. Not every author and/or book is for everybody and this one was certainly not my glass of chocolate milk. While the prose is without a doubt prolific, the story cr This is the most long winded book I think I've ever read. It's been a long time since a book has given me feelings of dread every time I picked it up. While the prose is without a doubt prolific, the story crawled at an excruciating pace with pages and pages of descriptive text. Some have commented that the prolonged details are necessary in the telling of the story, I humbly disagree. There are a ton of characters in this story and while they are all fleshed out to the nth degree, I didn't care about or relate to any of them. There is a lot of magic, as well religious undertones in this story, both of which turned me off immediately as I tend to steer clear of those subjects. I realize that I am in the tiniest of minority of people that feel this book fell way short of expectations while most every other reviewer fell in love with this book. I do not discourage readers from picking this one up for that reason alone. I just loved this book and it’s cast of characters! There is an Inn along the river called the Swan, where storytellers gather to drink and spin their magic tales on cold winter nights. One night, in walks a terribly injured man carrying a dead little girl. There are a few possibilities of who she could be. Some magical occurrence seems to take place regarding the girl, she’s actually alive, when previously thought dead by the local midwife/nurse. This story took me on a journey filled with magic, love, hardship, and a sense of peace also about when our time here is up. "As is well-known, when the moon hours lengthen, human beings come adrift from the regularity of their mechanical clocks. They nod at noon, dream in waking hours, open their eyes wide to the pitch-black night. It is a time of magic. And as the borders between night and day stretch to their thinnest, so too do the borders between worlds. Dreams and stories merge with lived experience, the dead and the living brush against each other in their comings and goings, and the past and the present touch "As is well-known, when the moon hours lengthen, human beings come adrift from the regularity of their mechanical clocks. They nod at noon, dream in waking hours, open their eyes wide to the pitch-black night. It is a time of magic. And as the borders between night and day stretch to their thinnest, so too do the borders between worlds. Dreams and stories merge with lived experience, the dead and the living brush against each other in their comings and goings, and the past and the present touch and overlap. Unexpected things can happen." This is my first Diane Setterfield novel and I very much enjoyed it. No doubt, she is a wonderful storyteller. One can easily imagine sitting in the Swan at Radcot and watching this magical tale unfold right in front of your very eyes while sipping on a mug of ale. The passage above sums up quite well the surreal feeling of this book. One night while swapping stories at the Swan, the town locals were stunned as a gruesome figure staggered into their midst. Even more startling was the fact that this monster carried in its arms what at first appeared to be a puppet and was soon noted to be the lifeless form of a little girl. "A body always tells a story—but this child’s was a blank page." At once, the patrons begin surmising and fashioning their own stories around the mysterious girl. When life is inexplicably restored to one who was surely in the grip of death, all manner of rumors begin to circulate. To whom does the ethereal child belong? Things get rather muddled when at least three different parties step forward with the certainty that the girl is the missing link to their own complicated histories. Much like the river Thames which plays a prominent role in the novel, the life stories of the various characters take many twists and turns throughout. "Its changes of direction are frequently teasing: on its journey it heads at different times north, south, and west, as though it has forgotten its easterly destination—or put it aside for the while." Likewise, the reader is never certain in which direction the story will take us. Each person’s true story is not immediately revealed. Many are suffering from personal grief and loneliness. Each tries to come to grips with their own reality by using different coping mechanisms. I appreciated the way Setterfield gives us just bits and pieces of the whole picture before we come to understand the truth. I loved the strength of the women in this story. Rita, the nurse, is forward-thinking. Having lost her faith years ago, she searches for the scientific meaning behind the unbelievable. Mrs. Constantine offers a progressive brand of healing. Bess Armstrong covers up her gift of a 'Seeing' eye with a patch. I would have loved to learn even more about the photographer, Henry Daunt. His ability to capture a moment in time usually provides answers, but not this time; he is likewise as perplexed as the next by the story of the little girl. Overall, Once Upon a River was a very satisfying read. Oddly enough, it was the girl at the center of the story that failed to capture me in the way I expected she would. But perhaps that wasn’t the point. She remained on the periphery of the story, but at the heart of the individual characters’ lives somehow. The story was slightly drawn out, and the ending not quite what I expected (though not a surprise either), so I can’t call this one perfect for me. However, I would not hesitate to recommend this one if you enjoy your fiction with a Gothic flare and a healthy dose of magical realism. It’s a fine tribute to the art of storytelling. Jaidee I love the honesty and measuredness of this review Candi....its only a semi-gush and sometimes that is better than a full-on one...lol ! I have this on I love the honesty and measuredness of this review Candi....its only a semi-gush and sometimes that is better than a full-on one...lol ! Candi Jaidee wrote: "I love the honesty and measuredness of this review Candi....its only a semi-gush and sometimes that is better than a full-on one...lol Jaidee wrote: "I love the honesty and measuredness of this review Candi....its only a semi-gush and sometimes that is better than a full-on one...lol ! I have this one on my list and your review makes me wish I ..."
Thank you to the publisher Atria Books for providing an advance reader copy via NetGalley. This is a very special and unique book that is one part folk tale, one part mystery and brewed with a touch of the supernatural. It takes place in England long ago astride the Thames River, which looms large in this story. The Swan is a family run pub where the preoccupation is telling a really good story. The best stories take on a life of their own and are repeated and spread amon 4.5 Stars rounded up to 5. The Swan is a family run pub where the preoccupation is telling a really good story. The best stories take on a life of their own and are repeated and spread among the townspeople. On one fateful night during the winter's solstice something breathtaking and miraculous occurred at The Swan. A very large man roared as he stumbled into the door, face ravaged with bloody injuries and holding what appeared to be a large puppet of a young girl. Except, it wasn't a puppet. It was a girl of about four, wet from the river...and dead. Then something magical happens. Who is she? Why doesn't she speak? And how can it be that three different families honestly believe this child is their own? This was enough information alone for me to be lured into the tentacles of this book! Well, not exactly. But it is a dark night in 1887, the solstice night, the longest night of the year. "As is well-known, when the moon hours lengthen, human beings come adrift from the regularity of their mechanical clocks. They nod at noon, dream in waking hours, open their eyes wide to the pitch-black night. It is a time of magic. And as the borders between night and day stretch to their thinnest, so too do the borders between worlds. Dreams and stories merge with lived experience, the dead and the living brush against each other in their comings and goings, and the past and the present touch and overlap. Unexpected things can happen." A crowd has gathered at The Swan, an ancient inn on the Thames River. The crowd is prone to storytelling, and no one tells a story like Joe Bliss, the husband of the Swan's landlady. But that night a story all its own takes shape—a wounded man comes staggering in and collapses, caught by some of the men at the inn. He appears to be carrying a doll or puppet of some sort, but the crowd is once again shocked when they discover it's not a puppet, but the lifeless body of a small child. "Her skin shimmered like water. The folds of her cotton frock were plastered to the smooth lines of the limbs, and her head tilted on her neck at an angle no puppeteer could achieve. She was a little girl, and they had not seen it, not one of them, though it was obvious." When Rita Sunday, the town's most reliable medical personnel, arrives, she takes care of the unconscious man and mends his wounds, and then examines the little girl. No one is sure what the little girl's connection is to the man, but a pall falls over the crowd at her untimely and tragic death. And then, a few hours later, she starts breathing again. No one, not even Rita, who searches for a scientific answer, understands how this could have happened. Who is this little girl? To whom does she belong? Where is she from? How is she connected to the wounded man? No one can find out any answers, especially because the little girl is mute and cannot provide any information. But of course, that doesn't stop those from near and far from inventing stories that explain her situation. And while fictions grow and become more elaborate, there are three families who believe the little girl belongs to them, and each has a complicated story about how they know this to be so, stories as twisted as the Thames itself. First and foremost, Once Upon a River is a tribute to the art of storytelling. It is beautifully told, and Diane Setterfield weaves together folklore, magic, myth, and good old tall tales as she unfolds this mystery. But beyond the questions that arise about the little girl, this book tells other stories as well, revealing long-held family secrets, regrets, recriminations, and suspicions. This is a dense book with a lot of characters. It took me a little while to get everyone straight in my head, because there are a few narratives unfolding at once. While I usually read really fast, the pacing of this book was a little slower, so I couldn't rush through it, and while I felt like it plodded a little bit from time to time, in the end, the pacing worked. If you rush through the story, you'll miss some of the richness of the plot. Setterfield knows how to set a mood, how to create fascinating characters, and how to tease out just enough suspense to keep you always wanting more. Once Upon a River is a special story, and I could totally see it as a television movie or miniseries, because so often the book came to life in my mind's eye. "The dead girl lived again." And the story, the mystery of the little girl, and those who would claim her as their own....began. This is a book that needed my full concentration to appreciate. I wanted to find a quiet reading spot and was able to just get "lost" in the weaving and turning and telling of the tale. Reminiscent of a dark fairy tale, blended with folklore, and mystery. A book for those who want to s A story that completely transported me to the Swan, a vintage inn on the Thames River. A book for those who want to spend time in the unfolding of this magical story. The characters were engaging and I was fully invested in learning what would become of the dead girl who lived again . Recommend to those who enjoy an epic tale that needs your attention to fully enjoy. Holly B Sheyla ✎ wrote: "Great review!" 3.5 stars! Charming, atmospheric & lyrically written! This was an extremely hard review for me to write because my thoughts are so conflicted with how I actually feel upon finishing this book. I thought the storytelling and the writing was absolutely fantastic but I was never able to fully immerse myself in this tale though. At times I was finding myself a little bit bored with my mind wandering often and at other times I was excited and in awe of what I was reading. ONCE UPON A RIVER by DIA 3.5 stars! Charming, atmospheric & lyrically written! 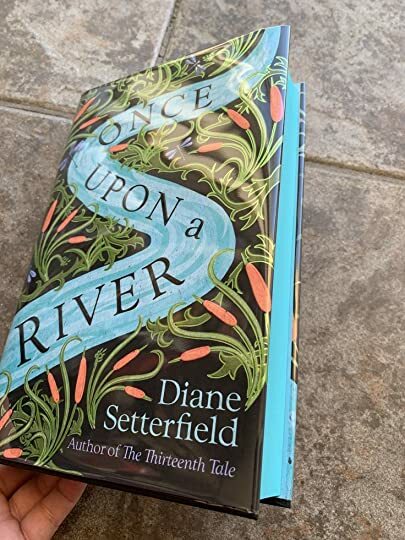 ONCE UPON A RIVER by DIANE SETTERFIELD is a magical and mysterious tale that takes you on a slow-moving and meandering journey that reminded me so much of a gothic fairy tale. Immediately upon starting this book there is this strong sense of folklore which I absolutely loved and found so appealing. I was never really able to fully stay within the flow of this novel though which was very frustrating for me. I do not by any means fault the author for my inability to stay fully focused on this tale though because I really think that I just don't do well with a slow burn. There was so much that was so appealing and unique about this book that I should have absolutely loved. This was definitely an enjoyable and entertaining read for me and it is one that I knew that I had to read. I am just a little disappointed that I didn’t LOVE this one more as I absolutely loved The Thirteenth Tale. I think if I didn’t have so many books on my plate right now and I was able to just relax and savor this story…...I probably would have loved it. Cover: Eye-catching, intriguing, whimsical, beautiful and a lovely representation to storyline. Title: An absolutely fabulous title that is extremely appealing and a wonderfully fitting representation to storyline and a homage to storytelling. Writing/Prose: Beautiful, elegant, lyrical, vividly descriptive, whimsical, well-written and fluid. Plot: Interesting, enchanting, suspenseful, folklore, intriguing, leisurely-paced, and entertaining. Ending: Satisfying although I wish that I was able to slow down my thoughts while I was reading this book. Overall: This lover of magical folklore would absolutely recommend this book! Thank you so much to NetGalley, Atria/Emily Bestler Books and Diane Setterfield for the opportunity to read an advance copy of this novel. This was such a pleasure to read. I loved the atmosphere the author created with rivers, rain and floods, old waterside inns, folk tales and unexplained mysteries. All just wonderful. It is a book to read slowly and carefully because there are a lot of characters to keep track of and the author constantly drifts off into side stories which are all equally interesting and deserve constant attention. The story winds as much as the river it describes. The central tale is the mystery of the drowned c This was such a pleasure to read. I loved the atmosphere the author created with rivers, rain and floods, old waterside inns, folk tales and unexplained mysteries. All just wonderful. It is a book to read slowly and carefully because there are a lot of characters to keep track of and the author constantly drifts off into side stories which are all equally interesting and deserve constant attention. The story winds as much as the river it describes. The central tale is the mystery of the drowned child who is recovered from the river and whether she is Ann, Amelia or Alice, but so much more goes on beside. Diane Setterfield writes beautifully and she creates the perfect historical feel to the characters and their way of life. There is magic in it too which fits in well - I loved the idea of Quietly, the boatman who rescues people from the river and helps them home unless it is "their time" when he will see them over to the other side. A lost girl, about four years old, turns up at the ancient Swan inn and tavern by the Thames River in 1887, on the night of the winter solstice. An injured man staggers into the inn, holding the apparently drowned girl in his arms, and promptly collapses. When the local midwife and nurse, Rita, arrives, she privately confirms that the girl is not breathing and has no pulse, though she mysteriously has no sign of drowning or other injury. But a few minutes later the girl suddenly lives and breathes again, stunning Rita and the others at the inn. The girl is wordless, and it’s soon discovered that she doesn’t belong to Daunt, the man who carried her into the inn. Who, then, does she belong to? Several people raise a claim: Robin Armstrong, the wastrel oldest son of a black gentleman farmer, Robert, claims her as his lost daughter Alice. Lily White, an abused woman whose younger sister may have died many years ago, insists (against all evidence) that the girl is her little sister Ann. Helena and Anthony Vaughan, a couple whose two-year old daughter was kidnapped two years ago, claim the girl as their daughter Amelia, although it soon becomes clear that Anthony has grave doubts, though those are undermined by Helena’s passionate conviction and her joy after two years of inconsolable grief. These and others are unique, interesting characters with strong backstories that flow like tributaries into the main river of the tale. The Swan inn is a place that specializes in storytelling, and the river that runs past the inn and flows in an out of the story throughout the novel, carries its own stories ― particularly Quietly the mythic ferryman, a gaunt figure who appears to those who are in trouble on the water, helping them either to life and safety or to “another shore.” A diverse cast of unusual characters, some tragedy, a mystery or three, a challenging romance, and a little magical realism spice up the plot of Once Upon a River. Water flows throughout the tale, a potent symbol that Diane Setterfield, for the most part, uses effectively (I did find the closing paragraph too pat). Everyone’s life has been touched by the river to one degree or another. Daunt is a photographer who’s endlessly fascinated by the river. Rita was born to a despairing mother who threw herself into the river, dying just after giving birth to Rita. Helena has always loved boating on the river, until her daughter’s kidnapping and disappearance two years ago. It had seemed then that her daughter’s absence had flooded Helena, flooded them both, and that with their words they were trying to bail themselves out. But the words were eggcups, and what they were describing was an ocean of absence, too vast to be contained in such modest vessels. She bailed and she bailed, but no matter how often she repeated the effort, she could not get to the end of it. Setterfield’s language is lovely and her storytelling is beautiful, with depths to it that most fantasy authors don’t aspire to. I also admire her ability to develop multi-layered characters and build a world that I felt wholly immersed in. Bill’s (my co-review at Fantasy Literature) primary complaint is that Once Upon a River becomes too concrete and obvious in its symbolism, structure and plot. That wasn’t an aspect that bothered me; I’m generally just happy to see symbolism make an appearance at all (I strongly suspect that my literary tastes aren’t as exacting as Bill’s). What did vex me was that the pacing of the novel was so languid until it finally picked up in the final third. But then it was fascinating to see all the various tributaries (plot threads) of the story come together, although Setterfield makes a little too much use of coincidence in tying the threads together and wrapping up her story. Though perhaps one might call those coincidences fate, or Providence, or even Quietly the ferryman watching over the river and the people whose lives are touched by it. Like the river that is the fluid, adaptable symbol for this Victorian-era story, Once Upon a River meanders at first, but gains force as it flows toward a compelling conclusion. It’s a profound and meaningful voyage that I enjoyed and would recommend to readers who enjoy thoughtful historic tales with a dash of fantasy. 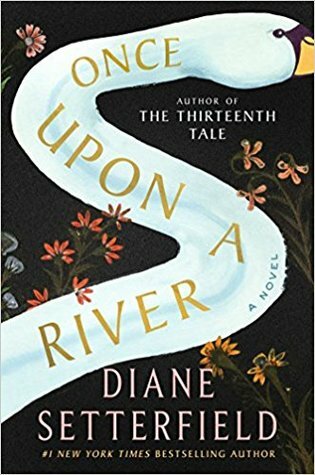 Diane Setterfield's bestselling novel "The Thirteenth Tale" was made into a recent television drama and this wonderfully crafted book "Once Upon A River" is her third and latest fabulous offering. I haven't read anything by this author before but I will be seeking out her previous books, after absolutely devouring and loving this compelling story based on folklore, romance and suspense. Magic realism at its best! As I started to read this hugely atmospheric tale, I honestly felt I was sitting by Diane Setterfield's bestselling novel "The Thirteenth Tale" was made into a recent television drama and this wonderfully crafted book "Once Upon A River" is her third and latest fabulous offering. I haven't read anything by this author before but I will be seeking out her previous books, after absolutely devouring and loving this compelling story based on folklore, romance and suspense. Magic realism at its best! As I started to read this hugely atmospheric tale, I honestly felt I was sitting by a roaring open fire in an ancient inn and being told the tale for myself, just like the characters were relaying tales in the opening of the story. The characters are truly wonderful too and you really do engage with them all. Each one tells his or her story with intrigue, that makes you really feel a part of, whether it's sharing sympathy or joy. The story is slow but rich in description and like the river the tale is based on, it meanders along, gently curving and lapping at the literary shores. This beautifully printed book is charmingly delightful and is exquisitely written with flair, talent and imagination. Every so often a special book comes along that sweeps you off your feet and this is one of them. It will stay with me for a very long time and if I never read another book again I can retire from reading very happy. A superbly feel-good story that oozes genuine emotion, one minute making you smile, the next feeling empathy for the character's distress and I was very saddened when the story ended as I could of kept on reading it forever. I can't recommend the spellbinding "Once Upon a River" enough or this talented author and I wish her every success with hopefully another well deserved bestseller. Loved it! A wonderful story of people living along the banks of the Thames, and of mysterious disappearances, love, violence, and neighbours, all held together with stories. Storytelling is an art form that not all can master. Young Jonathan tries to learn how by listening to his father, Joe, and the other regulars at the Swan, Joe’s inn. They tell and retell and polish stories, many of them about drowning. One dreadful night, a man stumbles in, dripping wet and bleeding from a badly gashed face and carrying the lifeless body of a little girl. Rita is the local nurse, and she does what she can to treat them both. But she is startled when suddenly, the child has a pulse. Speculation begins in the inn! “The drinkers began to talk, finding words to turn the night’s events into a story. They were collectors of words, the same way so many of the graveldiggers were collectors of fossils. They kept an ear constantly alert for them, the rare, the unusual, the unique. This is too tricky for Jonathan. He is not only too young, he is also hampered by his Downs Syndrome, making it hard to remember the format and the words. His mother, Margot, runs the inn, now that Joe’s health is failing, and she is helped by the daughters, referred to collectively as the Little Margots. Jonathan is a much-loved member of the family and of the inn regulars. Not all the families in this book are so caring. Nobody knows who these two rescued people are, but a little girl had disappeared, presumed kidnapped or drowned, two years ago, and this little one is about the right age and appearance. But she doesn’t speak. The couple who lost her are still distraught. The author introduces us to a few families, including a charismatic pig (dear Maud), and reveals some other mysterious disappearances, kidnappings, and/or runaways. Over, under, and around these stories runs the river. I don’t think you can read this book without being overwhelmed by the power of the river. I am going to include a long quotation here and let you find the book for yourselves to discover these wonderful people and their mysteries for yourself. “. . . furlong by furlong, singleness of direction is not its most obvious feature. En route the river does not seem particularly intent on reaching its destination. Instead it winds its way in time-wasting loops and diversions. It brings life and death, and it brings Quietly, the ferryman, a long gaunt figure whom some people claim to have seen poling his punt at great speed and who has saved them from drowning. He is also said to ferry people to “the other side” when their time has come to not be rescued. Reading this, you will be hard pressed to feel warm and dry, what with the rain and the winds and the mists and the winter dark during which some of this takes place. There is something about this book that reminds me of how much I loved Reservoir 13. The sense of people gathering together, the descriptions of the setting, and the communal loss felt when someone disappears. And a last word about the reliability of stories. Thanks to NetGalley and Random House/Transworld Publishers for the preview copy from which I’ve quoted. A captivating story that will take you on a journey. A stranger walked into the local inn late one night, soaked, still dripping from the cold river. In his arms he’s cradling a child, motionless. Everyone rushes in to assist. The stranger is close to death and the child, already gone. The owner of the inn sends for the village nurse. She tends to the unconscious man and only then confirms the girl’s death. But something doesn’t feel right to her. Suddenly her trained intuition is correct…as the child begins to stir. Everyone in the village comes forth, almost like a pilgrimage, to witness this possible miracle. And to claim the youngster as theirs. So who is this mysterious child? And how did she ever end up in the river, only to be rescued by a stranger? Diane Setterfield writes a beautiful story filled with magic and mystery. Though at times it was a bit too far out of my comfort zone, I hope you enjoy it and allow yourself to be taken down that river. Everyone has a story, and the regulars at the ancient The Swan inn on the Thames are no exception. They drink, swap tales, jest, and repeat. But, one night, a haggard man collapses on the threshold, the corpse of a small girl in his arms. The questions and, with them, the stories swirl. Who is she? How did she get there? Why do three sets of people separately feel they know her? And do the answers come down to science or magic or something else entirely? Much of the success of t Everyone has a story, and the regulars at the ancient The Swan inn on the Thames are no exception. They drink, swap tales, jest, and repeat. But, one night, a haggard man collapses on the threshold, the corpse of a small girl in his arms. Much of the success of this novel stems from the use of a large cast of characters. The reader’s focus, like the rushing water in the ever-present river, is never in one place for too long. Helena and Anthony Vaughan hope the girl is their daughter, kidnapped two years prior. Robert Armstrong, a Black farmer, assumes the girl is his absent son’s daughter. Lily White, surely in her forties, claims the girl as her sister. Through it all, Nurse Rita Sunday and photographer Henry Daunt, juggle between the factions, investigating and aiding, while their own stories complicate. Each section contains riveting, high-stakes, and sometimes even playful wordcraft and plot-play at its finest. At the novel’s core is the conundrum of the child, and this alone would be enough for a healthy book. However, author Diane Setterfield’s prose twists and turns, but always moves with the current. The multitude of plotlines are never overwhelming, and the result is a fully realized world that’s easy to dip into. She guides readers across scenes like an expert ferryman, a twinkle in her writing. She knows how both the story and the trip will end but understands it’s really the journey that’s important. Just when you feel you know where you’re going—Ah, look! Another turn up ahead. Special mention must be given to the folklore, myths, and magic which are abundant. The novel takes place on the cusp of change, right at the dawn of Darwinism. Rita opts for scientific reasoning in the face of mysticism and folktales. These two worlds are most interesting when complicated by each other. In many ways, assuming this were all true (and, really, aren’t all stories based in some truth? ), this places the events of Once Upon a River as perhaps the first of tales somewhere between fairytale and science story. At the beginning, readers are introduced to the inn regulars who constant opine on the art of the story. Diane Setterfield deftly suggests everyone has a story, and we should all be thankful she shares hers. Note: I received a free ARC of this book through NetGalley. A young girl is found, brought to an old local tavern by a man who is both distraught and in need of help. The child appears dead and the man is in such bad shape he can't tell the people what has occurred, where he found this child, or how he managed to pull her from the ice cold water of the Thames. But then the child breathes after life was thought to have left her, and the story is set in motion for a tale with includes the magical, the mystical, folktales of yore, and a journey that takes t A young girl is found, brought to an old local tavern by a man who is both distraught and in need of help. The child appears dead and the man is in such bad shape he can't tell the people what has occurred, where he found this child, or how he managed to pull her from the ice cold water of the Thames. But then the child breathes after life was thought to have left her, and the story is set in motion for a tale with includes the magical, the mystical, folktales of yore, and a journey that takes the reader onto a path of intrigue, suspense, romance, and magic. Another child has gone missing these past two years and her parents have lived a life full of agony at their loss Could this child be their Amalia? Another family with an errant older son feels that this child could be his daughter, Alice, their granddaughter. Then there is Rita, a nurse, who doctors both the child and the village. Is this child the daughter of her heart? What about the man, the photographer, who pulled the child from the water? What does he feel and see in this young girl? Still there is another woman who, although she is in her forties claims, this four year old is her lost sister. How can that be? Then there is the child. She seems ethereal, never speaking, seeming to be birthed from folktales of long ago, a child of the water in which she was found. She is the child they all want and yet will she ever belong to any of them? I absolutely loved this atmospheric tale of love, loss and what happens in the in between. Having read and loved Diane Setterfield's The Thirteenth Tale, I was ever so anxious to read this one. I was not disappointed as Ms Setterfield wove a tale that was magical, atmospheric, and otherworldly. It managed to entrance me and pull me into its mystical yet eerie presence. I definitely recommend this story if you love books that build upon the spiritualistic and the imaginary nature of all tales handed down through the years. Thank you to Diane Setterfield who kept me entranced, Atria, and NetGalley for providing a copy of this mesmerizing story. This couldn’t be less than a 5 star read. If you ever wondered what superlative historical fiction, superlative storytelling looked like, then you need not look any further. This book follows the ebb and flow and rhythms of the river and the people who live by its sides. A wonderful story of the supernatural, of treachery, of wrongs set right, of bereavement, love and loss. I read The Thirteenth Tale a long while ago and wasn’t bowled over by it. This seems much better, but I am now wondering whe This couldn’t be less than a 5 star read. If you ever wondered what superlative historical fiction, superlative storytelling looked like, then you need not look any further. This book follows the ebb and flow and rhythms of the river and the people who live by its sides. A wonderful story of the supernatural, of treachery, of wrongs set right, of bereavement, love and loss. I read The Thirteenth Tale a long while ago and wasn’t bowled over by it. This seems much better, but I am now wondering whether I need to go back and read it again. DNF. Too much magical realism and a fable-like quality to the writing. I do enjoy the genre on occasion but this is not the right time in my life to have the patience for it. I have too much going on. Perhaps I will try it again at some point in the future. Diane Setterfield is a British author. Her bestselling novel, The Thirteenth Tale (2006) was published in 38 countries worldwide and has sold more than three million copies. It was number one in the New York Times hardback fiction list for three weeks and is enjoyed as much for being ‘a love letter to reading’ as for its mystery and style. Her second novel, Bellman & Black (2013 is a genre-defying tale of rooks and Victorian retail. January 2019 sees the publication of her new title, Once Upon a River, which has been called 'bewitching' and 'enchanting'. The Thirteenth Tale was acquired by Heyday Films and adapted for television by the award-winning playwright and scriptwriter, Christopher Hampton. Starring Vanessa Redgrave and Olivia Colman, it was filmed in 2013 in North Yorkshire for BBC2. The TV rights to Once Upon a River have even sold to Kudos (Broadchurch, Spooks, Grantchester). Diane Setterfield has been published in over forty countries.